Note added 10 September 2003: in Brownsville, Texas, UTB/TSC and Brownsville's South Texas Astronomical Society sponsored two nights of public viewing of Mars, 27 and 28 August, with over 1,000 estimated to have come each night! Thanks go to the many individuals that made both nights a success. Some may have the impression that they have "missed" seeing Mars. This is not so! Mars remains a special sight--with or without a telescope--since the Earth is gradually pulling ahead of Mars over the next month or two. Every sixteen years or so a similarly close opposition to Mars occurs, and even the less favorable oppositions every 26 months are great viewing opportunities. Mars is the fourth planet from the Sun, or the next planet out from the Earth. Often visible with the unaided eye, it has long been a source of fascination. Mars is about half the size of the Earth (in diameter). Its atmosphere is much thinner than the Earth's, and is mostly carbon dioxide. The average temperature on Mars is -45° C (-50° F), although it can range from -100° to 0° C (-150° to 30° F). Liquid water cannot exist on Mars on the surface. The time for Mars to complete one orbit around the Sun, the Martian year, is 687 days or 1.88 of our years. But Mars rotates on its axis once every 24 hours and 37 minutes, very similar to our day. The surface of Mars is rock and dust. 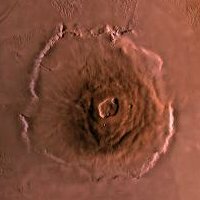 There are many craters from the impacts of comets and asteroids, but there are also vast plains with extinct volcanoes larger than any on Earth, a rift valley the length of the United States, and channels apparently cut by running water sometime in the past. Mars appears orange with dark brown regions of wind-blown dust. There are also white polar caps of ice and dry ice (frozen water and frozen carbon dioxide) which expand and contract with the seasons. Three NASA robot probes have sent back pictures from the surface of Mars. They show rock-strewn plains of dust and sand dunes. The sky is pink, colored by dust in the thin atmosphere. Some pictures have shown morning frost in the winter. Mars has two small moons, Phobos and Deimos. They are each dark irregular objects, smaller than a large city. As late as the 1960s, many astronomers thought Mars likely to have life, given its similarity to the Earth. Robot space probes showed it to be cold and dry, however. 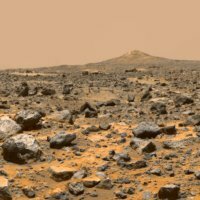 In 1976 NASA landed the Viking probes on Mars. Their tests for living microorganisms indicated no life on Mars. But astronomers still think we might find evidence of past life, like fossilized microorganisms. 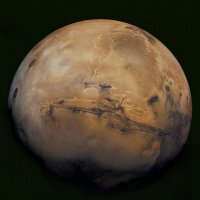 How close is Mars now and why? Mars' average distance from the Sun is 1.5 times greater than the Earth's average distance. As the Earth and Mars each orbit the Sun, with the Earth orbiting faster, periodically the Earth catches up to Mars and is adjacent to it. This is called an opposition, and happens every 2 years. Some oppositions are special. Mars' orbit is more elliptical (meaning less perfectly circular) than the Earth's orbit. About every 16 years, Earth catches up to Mars while Mars is at its closest point to the Sun. This is a perihelic opposition. The orbits of the planets vary slightly over time, because all the planets exert slight gravitational tugs on each other. NASA has calculated that the last opposition of Mars this close would have been in 57,617 B.C. The next one this close will be in 2287. Of course, the difference from other perihelic oppositions is slight: Mars will be only 5% closer than it was in 1988, 0.7% closer than in 1971, or 0.04% closer than in 1924. Still, at 4:51 AM CDT on August 27, Mars will be "only" 55,758,006 km (34,646,418 miles) away from the Earth. This is 145 times further than the Moon, or one-third the distance to the Sun. From early August to late September, it will be close and bright. Right now Mars looks like a bright reddish-white star in the constellation Aquarius. In August-September 2003 it will rise by 9 PM and be in the southern sky around midnight (for observers in south Texas). Without binoculars or a telescope, you can't miss it: it is brighter than any star in the night sky, and doesn't twinkle. With binoculars, you may be able to tell that Mars is a disk (not a point of light like the stars). But with a good telescope, this is a good opportunity to see surface features on Mars. Mars would appear as an orange disk, with shaded areas of darker dust and one polar cap visible. The diagram below shows some surface features that might be visible in a good telescope, depending on which side of Mars is rotated toward us. The six views cover a full rotation of Mars (24 hours and 37 minutes). A sequence of views showing the Mars as it goes through one rotation. NOTE: if you are viewing Mars through a Schmidt-Cassegrain telescope, each view should be reversed from left to right; if you are viewing Mars through a refracting telescope, each view should be reversed from top to bottom. Once each Martian year, when Mars is closest to the Sun as it is now, a dust storm develops which eventually covers most of the planet. This will probably obscure the view for telescope viewing later. Your local public library (or school library for students) is a good place to read more about Mars. Two good magazines which may be available are Sky and Telescope and Astronomy. In Brownsville, Texas, the South Texas Astronomical Society meets monthly at the Brownsville Public Library. The University of Texas at Brownsville Physics and Astronomy Department is engaged in astrophysics research and offers astronomy courses to university students. This includes its Center for Gravitational Wave Astronomy, supported by NASA and concerned with gravitational wave research, both theoretical and observational. The Brownsville Alliance for Science Education ENLACE Project in cooperation with the University of Texas at Brownsville is finalizing plans for an astronomical observatory which will be dedicated to public outreach. Last modified 10 September 2003.